We went to Mt. Auburn looking for birds and beasts. In the past, we’ve seen rabbits, ground hogs, foxes, hawks, and robins, but we had a few surprises this time. This is a lovely catbird. I’m afraid you can’t quite distinguish his/her black cap. 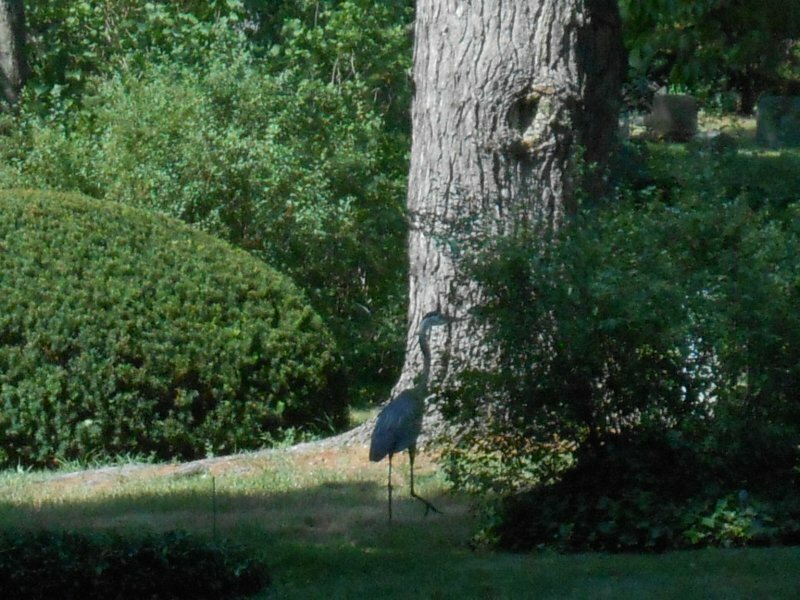 We have at least one who lives near our house and is rather friendly, visiting the bird feeders, sipping from the bird baths and fish pond, and plucking up multi-legged critters from the ground. 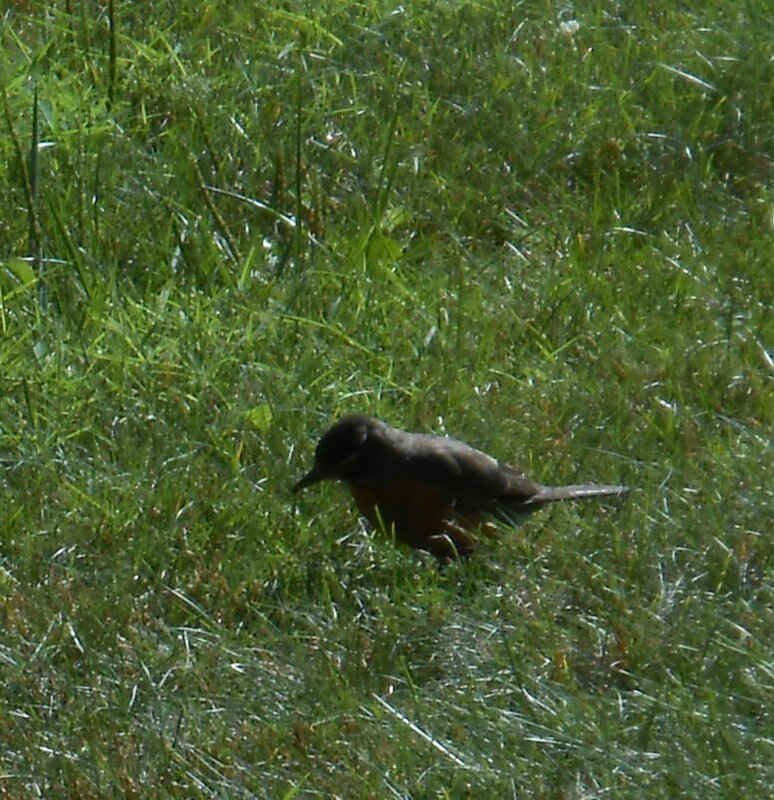 We also saw tons of robins. I wanted to include this picture for my British viewers. 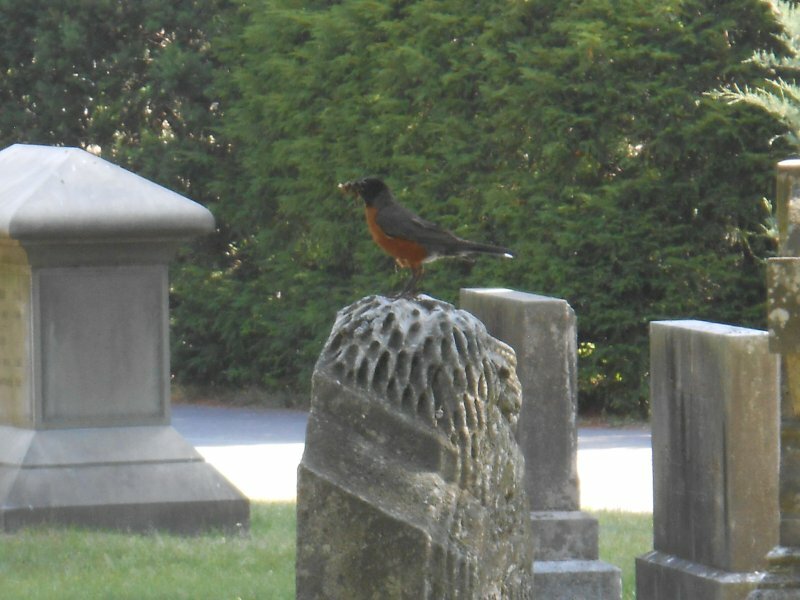 Your robins are adorable, petite, and feathered lovely blue and rust. 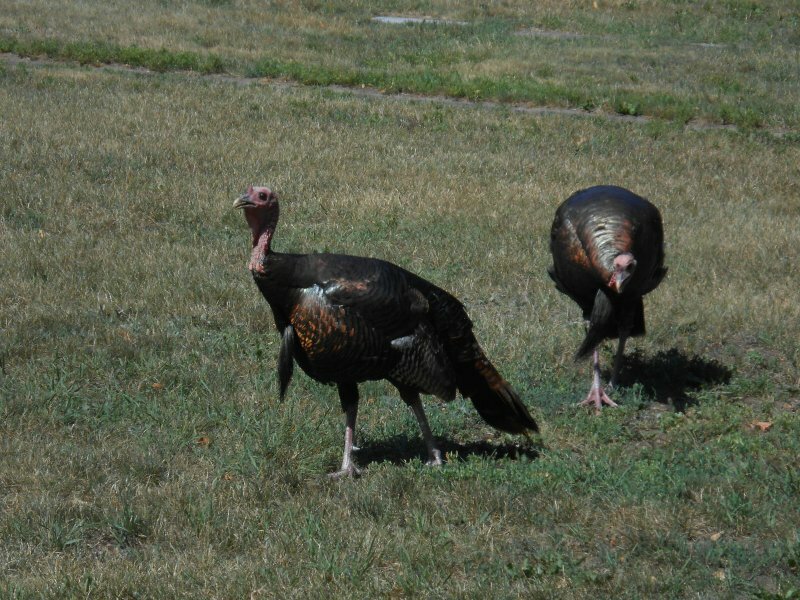 Ours, as you can see, are longer and larger, with a grey/black body and striking rusty-red tummy. Their faces and build are similar to your blackbirds, though yours are really black. I heard that your robins were struggling. How are they doing now? Here was a nice surprise! 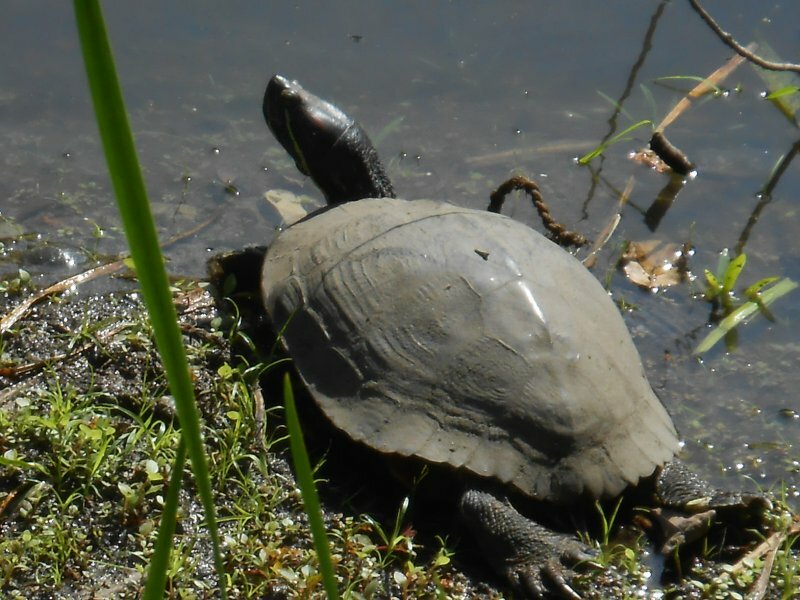 Down by one of the ponds, we found quite a few painted turtles sunning themselves. Look at this guy stretch his hind legs. Seems comfy, doesn’t he/she. 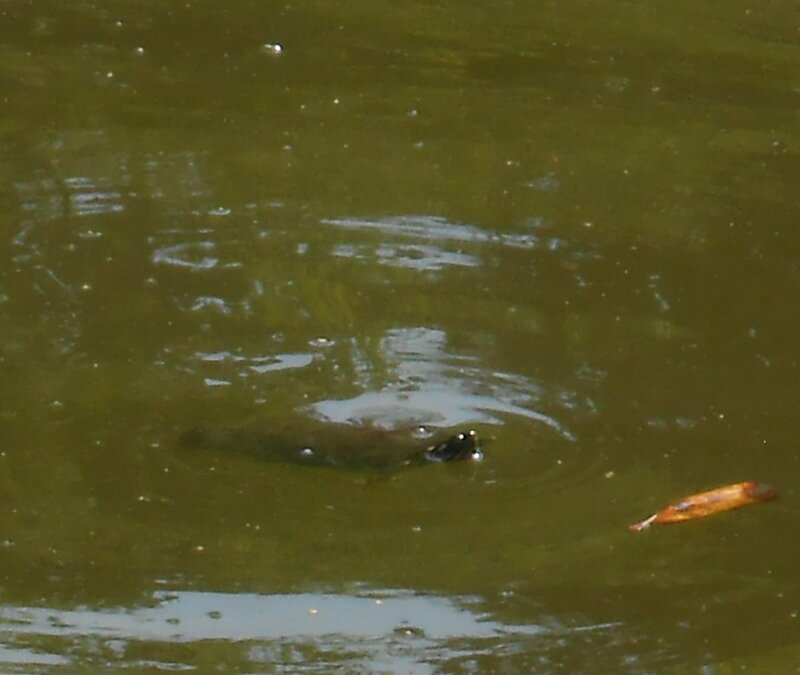 Meanwhile, in the pond, a baby was swimming around like crazy, having a ball. maybe this guy on the shore was a watchful parent? 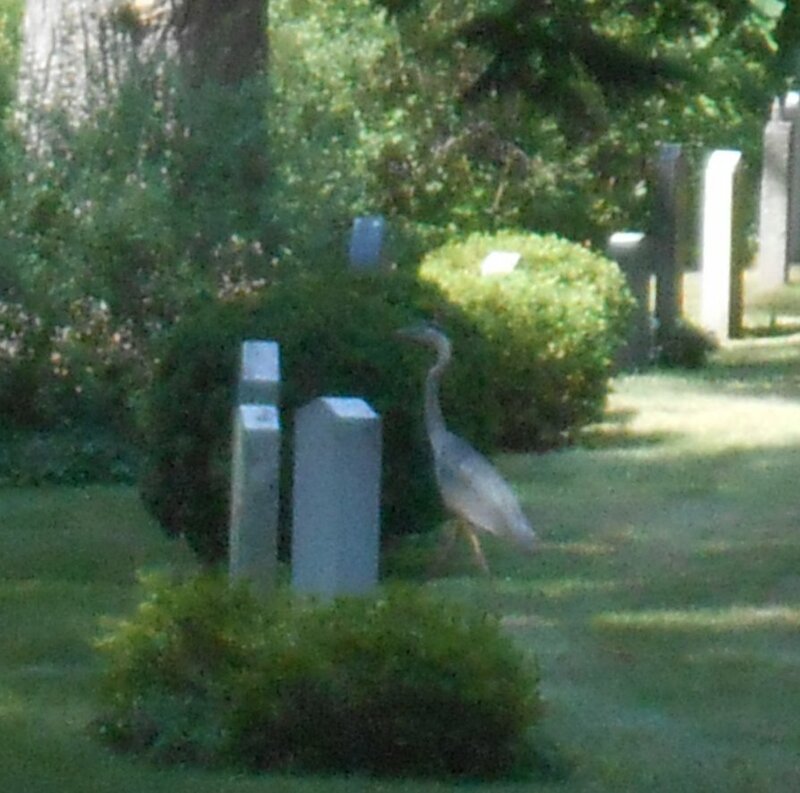 We really had a surprise when we saw and were able to follow a Great Blue Heron around the cemetery. We expected to see him wading in one of the ponds. That’s how we usually see them, but not this guy. He just took himself on the most casual of strolls, looking around, chilling out. maybe he was looking for a friend? 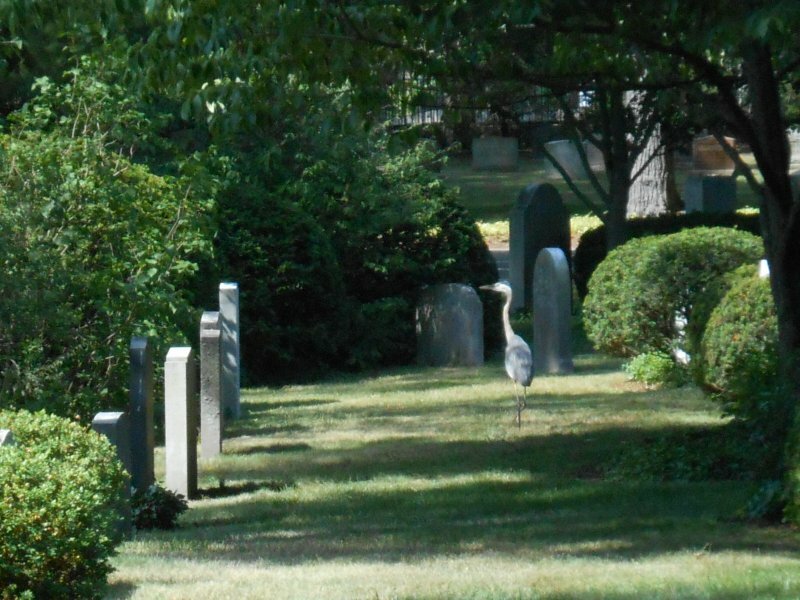 Okay, here he is paying his respects. Heading back to our car we got the biggest of surprises! 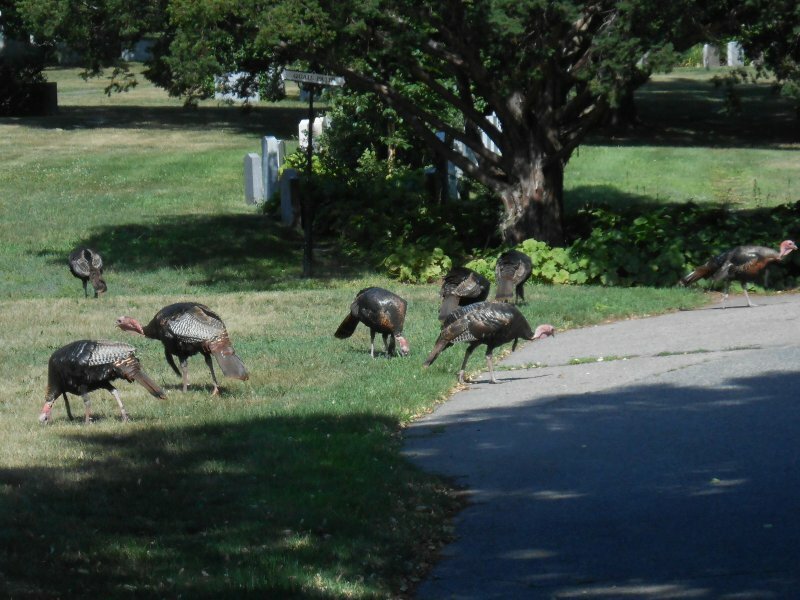 A flock of about 8 or 9 wild turkeys! Notice the “beards” hanging from some of the birds. I’d never noticed that before. 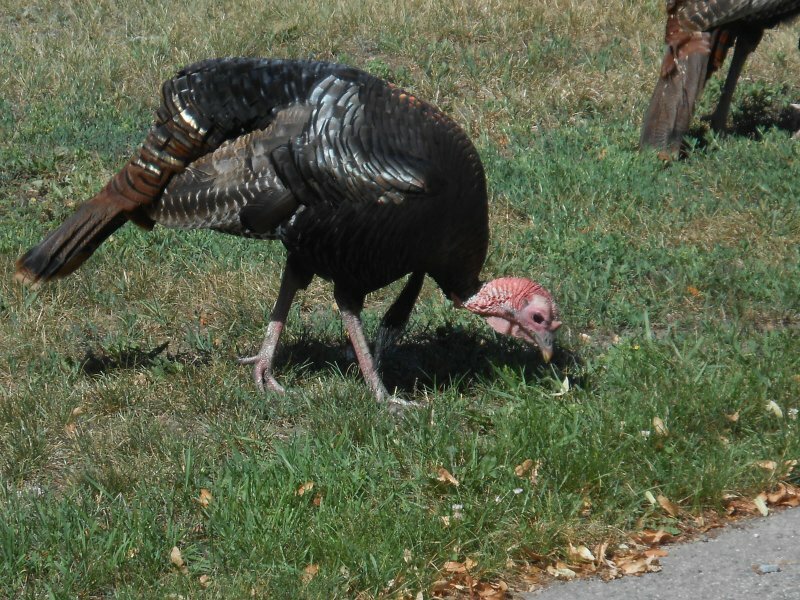 I talked to a woman who was planting some flowers at a relative’s grade, and she told me the turkeys were making her nervous. 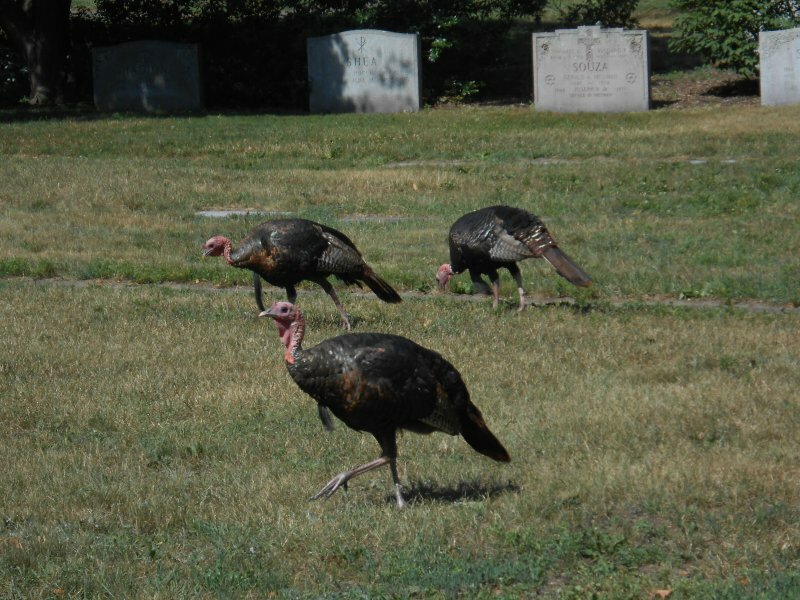 Apparently, a turkey had gotten too aggressive with one of the workers in the cemetery last week, with things had not going well for the turkey. I have heard that these wild bird can be exceptionally bold. These guys didn’t bother us, but then, again, we didn’t bother them, either. I prevented Yang from mentioning either dreaded trigger word: Thanksgiving or drumstick.